The four-story, 18,700 sq. 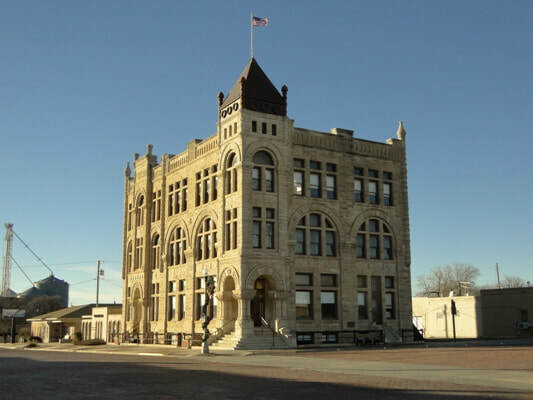 ft. stone building at the intersection of Main Street and Pennsylvania Avenue, in Ness City, Kansas, was called, upon its completion in 1890, "The finest and most imposing structure west of Topeka." The building contract was awarded Nov. 29, 1888, to William Ruff of Ness City, Kansas, for $34,000; other estimates placed the ultimate cost of the building at $75,000. The stone masonry was addressed to Daniel J. Rogers of Newton, Kansas, under sub-contract of $2,900; stone detailing on the arches was carved by P.A. Narey of Bazine, Kansas. ​Instead of sand, crushed and ground limestone were used as an aggregate for the mortar to insure an exact match with adjoining stone. The window fenestration is generally grouped in threes with second floor windows enclosed in enormous semi-circular arches which rise from the first floor line and provide a striking accent to the facade. The pyramid roof structure is flanked by four cut-stone spires. Tower stonework shows the fine craftsmanship of the 1880s. ​In October, 1889, the cornice roof was installed by Eaton and Cramer. There are 30 rooms in the bank building. The building has an elevator shaft, unique for its time. Four large walk-in vaults with original burglar alarms remained in working order throughout the years. An original oil painting, finished in 22-karat gold, adorns the vault door in the Great Room and further enhances the beauty of the interior. Throughout the building the ceilings are 13 feet high. Brass door knobs and fixtures, of a sunflower design, give some indication of the expensive hardware used. After the Citizens' State Bank was established, the iron stairway for the third floor was put in place (Sept. 26, 1903). Jasper Walton painted the woodwork on the third floor, the finished room making a courtroom any county in Kansas would be justly proud to have. (Sept. 26, 1903). In 1938, the building was sold for taxes and purchased by R.B. Christy, a banker-philanthropist from Scott City, Kansas. He spent considerable time and money repairing the building. Charles Blackburn of Scott City, Kansas, worked almost a year on the building, painting, repairing and generally getting it in better shape. A new floor of oak was put in the bank room. ​The tenant for that time was an oil company. The post office then became the next tenant and leased the floor for the next ten years. In February, 1972, the building was placed on the national Register of Historic Landmarks. In 1983 the steeple was repaired and painted and all 110 high arched, hand-carved windows were re-painted. ​In 1984, after ten years of vacancy, and at a point critical to its preservation, the rapidly deteriorating monument was purchased by the Ness County Bank Building Foundation, Inc., using $30,000 in Federal Revenue Funds, donated by Ness County, and, $15,000 in Industrial Revenue Funds, donated by Ness City. The Foundation enlisted the help of both engineering and architectural firms to determine the necessary steps to prevent further deterioration and to structurally stabilize the building. Following their recommendations: a new roof was installed; exterior stone was re-pointed; gutters and downspouts replaced; windows re-glazed; unwanted material removed; and building and grounds were cleaned. 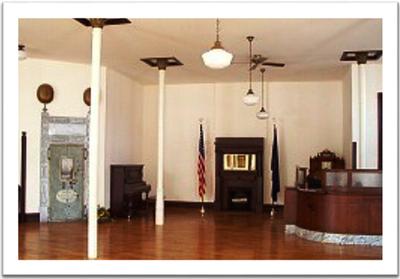 In 1988, the west portion of the main floor was remodeled to house the Ness City Chamber of Commerce office. In 1989, the Ness City Chamber of Commerce donated a "Gift of Lights" to the building. This imposing structure, outlined in lights during the Christmas season, is an inspirational vision worth the traveling just to experience. Renovation of the Great Room in the east portion of the main floor was completed in 1990. The Great Room is used as a common hall and exhibit area. It lends itself well to community meetings and programs. A variety of events are hosted there. An adjoining room was converted into a modern, efficient kitchen in 1991, completing renovation of the main floor. In 1994, the lower level was transformed into a "Kansas" store - Prairie Mercantile. Foods, books, ironworks, pictures, wheat weavings, post rock carvings, quilts, etc., etc., made in and indicative of Kansas, are in abundance. "Manned" by volunteers, all profits go toward the remodeling of the building.